Skye Denison from Denise Swanson’s New York Times bestselling Scumble River mystery series talks about her upcoming nuptials. Hi! My name is Skye Denison. I’m a school psychologist in Scumble River, a small town seventy-five miles south of Chicago nearly seventy-five years behind the times. Although I left town as soon as I turned eighteen and stayed away for the next twelve years, I eventually returned, and now that I’ve been back for a while, I realize that Scumble River is indeed home. I still miss some of the diversity of the big city, but I’ve made my peace and have no plans to leave ever again—except for brief periods of time like my honeymoon. Yes, I’m getting married. As my mother so kindly pointed out, I guess it’s about time. I’m turning thirty-six this December, but I’m too busy to have a party because that’s also the month of my wedding. Five days after Christmas, I walk down the aisle of St. Francis Catholic Church and say I do. At least, that’s the plan. Right now, I’m regretting my decision. Oh, not the marriage part, but the rest of it. Why in the world did I think it would be a good idea to have a wedding so close to the holidays? You’d think with my December birthday, I’d have known better. True, I had little choice in the matter. With my job, I don’t get to choose my vacation time, and my fiancé refused to wait until next summer. Still, as long as no one gets murdered, I should be okay. Everything is on schedule, and even though my mother is doing her best to drive me crazy, I’m resisting her attempts to try and outdo my California cousin’s over-the-top platinum wedding. So far, I’ve nixed her idea for live doves, an Elvis impersonator, and a wedding dress with a twenty-seven foot train. I kind of liked the diamond-encrusted tiara, but the fifty flower girls were just too much. I’m still holding my breath to see if the ghost of the previous owner of my house will let my fiancé and me…uh…you know what…once we’re married since right now she usually blows something up or sets the alarms off if we try. I sure hope once our union has been blessed her sense of right will be satisfied. Well, a few more months and we’ll see what happens. Just keep your fingers crossed for me that no bodies turn up. I so don’t want to be investigating a murder the week before my wedding. 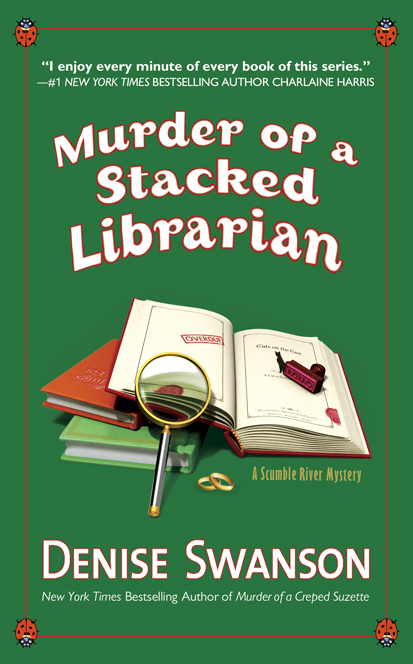 If you’re interested in Skye’s wedding, read all about it in Murder of a Stacked Librarian coming out September 3rd. I have enjoyed the Scumble River series with Skye Dennison and have read every book. Looking forward to reading this one. 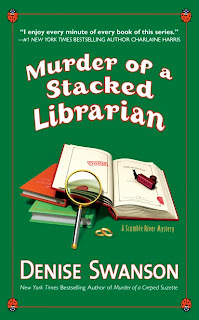 Dear Denise: Every time I read the title of your Stacked Librarian I chuckle to myself. Love the name. And I always know that each and every book of yours that I read, will bring me great pleasure as they have for all of these years. You are one terrific writer and I am never disappointed with any of your series. I have this one on my wish list along with many others; I have to pace myself as I really only like paperbacks not e-books so much, so have to order only a few at a time; I would max out credit cards with book buying if I didn't have will power like I do. Keep up the great writing and I hope that I will be around for many more years to read all of the great books that you put out for your fans to read. Churches are so pretty at Christmas time! It's a good time to walk down the aisle. Have a happy birthday in December, that's when mine is too. Looking forward to the book. I wish you a great wedding day Skye, and as for the ghost ... well. Can you talk to her and ask? Otherwise, you would just have to move. Thanks for all your comments! I'm so sorry I wasn't here earlier to answer you, but my biographer is under a deadline and didn't get a chance to type this up for me. See you all in September!